Fig. 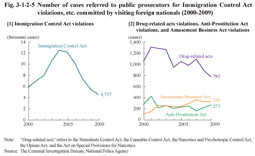 3-1-2-4 shows the numbers of cases and persons referred to public prosecutors for special act offenses (excluding violations of traffic related acts; hereinafter the same in this section) committed by visiting and other foreign nationals (from 1980). The numbers of cases and persons referred to public prosecutors for special act offenses committed by visiting foreign nationals both reached a record high in 2004, but then started to decrease, and were 7,275 cases (down 9.6% from the previous year) and 6,067 persons (down 9.9% (id. )), respectively, in 2009. 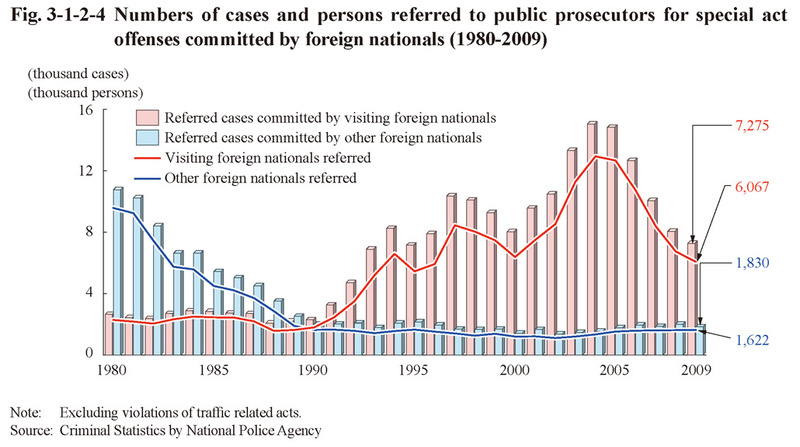 Since 1990, both the numbers of cases and persons referred to public prosecutors for special act offenses have been larger for visiting foreign nationals than other foreign nationals. With respect to the referred cases for special act offences committed by visiting foreign nationals, it was revealed that by type of offenses, the proportion of Immigration Control Act violations was overwhelmingly high. Fig. 3-1-2-5 shows the number of cases referred to public prosecutors for offenses high in proportion. The number of referred cases for Immigration Control Act violations was on an increasing trend from 2001, but then continued to decrease every year from 2005, and was 4,737 in 2009 (down 15.7% from the previous year). 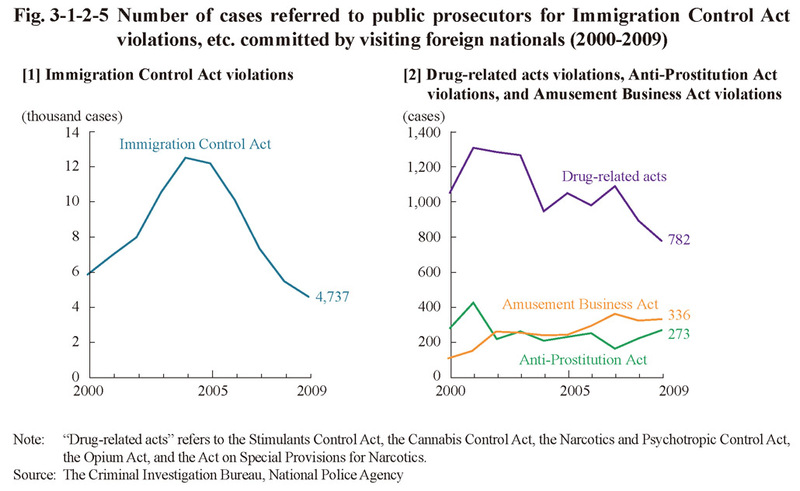 As for the referred cases for Immigration Control Act violations in 2009, by its violation categories, illegally overstaying was the largest in number at 2,816 cases, followed by illegally residing at 1,132, failure to carry a passport/refusal to present a passport at 454, and engaging in activities other than permitted under their status of residence at 163 (Source: The Criminal Investigation Bureau, National Police Agency).